I’m going to try something different here on 99CMDR Problems. I’m going to keep a running review of the cards that are being previewed in the new Eternal Masters set. Once a new card gets previewed by an official previewer (they were given that card, not just a leak), I’ll throw my two cents on here. Newest previewed cards on top. 5.0 – Must have staple in every deck in those colors. 4.0 – Very good card and must be considered. 3.0 – Good card in those colors, sometimes a roleplayer. 2.0 – Usually only part of a combo deck or not that spectacular. 1.0 – I would advise against using it. I’m going to also include if it’s a new art, first time in foil, article of the preview to get more in depth (most likely non Commander related), and the last printing if you want the older card. Images from mythicspoiler.com. A card so good it’s boring? Maybe. Sets that have printed Wrath of God: From the Vault: Annihilation, Commander 2013, Tenth Edition, Ninth Edition, Eighth Edition, Seventh Edition, Textless Players Rewards, Battle Royal Box Set, Sixth Edition, Portal, Fifth Edition, Forth Edition, Revised, Unlimited, Beta, Alpha. 15 Times (Though only twice in nine years to be fair). Sets that have printed Damnation, it’s Black color-shifted counterpart: Judge Promo, Textless Players Rewards, Planar Chaos. Enjoy your Void (And Toxic Deluge too). There are two things that Black can do well: kill creatures and make players discard. Red can kill artifacts pretty well. Put them on a card and you could have a huge hit. Make you choose a number for converted mana cost in order to kill said things? Well, that’s when we get into a bunch of trouble. It can be good if an opponent is playing a deck with a bunch of cards, or tokens, that cost the same. The fact that you have a chance to keep your stuff alive is the saving grace on this card, but mostly you’ll be using this as a 2-1 or if you’re lucky like 4-1. That’s still a good card, but it’s never a truly a feel good card unless you blow someone out with it. Then that’s the best feeling. The fourth of the tutor cycle, this one ranks just behind Vampiric Tutor as the best once since Blue loves instants and sorceries. Go grab a card with Miracle, say Entreat the Angles or Temporal Mastery or Terminus, and profit. Mix this with Sensei’s Divining Top and you can draw that card this turn, something not unheard of in Commander. It’s a tutor, and unless you spend 20 minutes searching through your deck, everyone likes a tutor effect. This is one of the best. FIRST TIME IN FOIL ALERT! If you sacrifice a creature, it pays your Commander Tax. That’s the bare minimum this card does. But in reality, it’s a huge combo enabler with so many different combos I can’t go into them here. 17 years since its last printing, the hope is to see this in more Commander decks because it should be. Sacrificing the creature is free (which is great if an opponent wants to steal a creature), and tokens love it as well. Hopefully this card will get more love and be more than the combo engine it’s usually played as. I had to go to edhrec.com to find out how often this card is played since I couldn’t remember it ever in a Commander deck. It’s a fun card, but it’s just not that useful in Commander. The other three little words that strike fear into Magic players: Destroy target permanent. The only draw back is the sorcery speed, there’s pretty much nothing else to dislike about this card. I prefer the original Apocalypse art, but that’s because the art in that old frame looks fantastic and iconic. This card is so good that for a few years WotC has been trying to “remake” this card in Utter End and Anguished Unmaking (also fearing Sorin in the art). Yes, this card is worth it in every deck you can cram it into as it will solve almost anything that’s troubling you. What makes this better than Bloodbraid Elf? Simple, it’s in Blue and it costs less. With Cascade, the higher the cost the more it hits things. Great for Maelstrom Wanderer since you want to hit big creatures and swing with them. Shardless Agent lets you miss bigger spells and hit more direct effects you may want to cast (Draw, ramp, bounce, etc) earlier in the game. Plus, being in Blue, you can bounce him back to your hand and cast it again (Deadeye Navigator trick doesn’t) work here. You can hit more consistent cards if you build it with Shardless Agent in mind. Also a bonus: Artifact. Abuse that to your heart’s content. Hymn is a really good card, just not in multiplayer. If you play 1v1 Commander, then this rating changes completely (for the better), but I’m not focused on that here. COMMANDER ALERT! 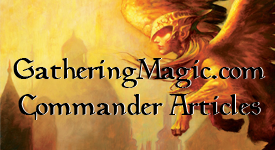 Only printed in Planechase 2012 (which will also see print in the Planechase Anthology later this year), and the hard to acquire Commander’s Arsenal, this powerhouse Commander warps formats whenever he’s cast. The new art looks wonderful and The Wanderer opens up plenty more deck styles than Animar, Soul of Elementals usual “Creatures and Lands only”. Cascade is so good, even when it gets countered you get the effect. Twice here. “Pinging”, the act of dealing one damage, used to be in Blue. Crazy, I know. Tim here is a relic of the past. Run to see him again, but unless you’re playing pauper Commander or a really weird highlander variant, I just don’t think he makes a list. COMMANDER ALERT! Let me tell you about this card. Back when this was first printed, it basically had to be Legendary because a 6/5 flying haste for 6 was too good. This is the same set that saw a 4/4 for 2GG that didn’t have a drawback and everyone thought powercreep. This old Pit Fighter might have been passed up in the cool department two sets later when his undead self was just more fun to play, but in a format where you only care about having one copy of a card, the Legendary tag doesn’t matter and hitting for 6 is still good. FIRST TIME IN FOIL ALERT! I honestly thought that when this card came out in Commander 2013, that it be a huge hit. Not only do you get to remove any permanent, but you force them to draw it again (unless you do it in response to them searching their library then it’s bye bye for a while). The X is just bonus as for WW you can do the same as 1UG with Temporal Spring but as an Instant. But it’s not been that popular from what I can tell. Is it the only one printing? It may not be a superstar but I still believe that it’s a valuable card. FIRST TIME FOIL IN NEW FRAME ALERT! Ah, the Blue Mage’s closet and best friend. All it takes is two untapped Islands and three little words to scare an opposing mage. The first time seen in Magic boosters since Seventh Edition, Counterspell gets the job done. Powerful even without adding on any keyword mechanics or additional text. Never be ashamed to cast this card. Late last week, I threw out the nominations for the first annual Commander Oscars. I received a great deal of interest and now I can share those results. On social media I was asked several questions and why X card was snubbed. I’ll detail the answers as we go along. First, I pulled information from EDHRec.com, a fantastic Commander resource where you can see information about what other people have put in their Commander decks. It was a judgment call from across the varies sets (cards from older sets have had more time to be used in more decks), but I tried to grab what I believed were the most used cards for each subsection. If you disagree, you can submit your own decks to EDHRec (which I suggest you do), but I feel as if it was seeing play in decks people are putting online then it must be good. It’s not an exact science, but neither are the Oscars. Speaking of the Oscars, /u/ayjel89 suggested it should be named like the “Solies” for Sol Ring or off of some other well known Commander cards. Since this project was a success and I’m going to do more build up for next year, a real name should be used. I’m open for suggestions but I won’t look into next year until the next Oscar nominations. But a new award name will be chosen. No one voted for the winner 100% of the time. The closet were five entrants that voted for the winner 81.9% of the time (Nine out of Eleven times). Zach from Twitter, Riley, Shai and Mark from Reddit and Brandon from Facebook. Be proud. Wastes/Mirrorpool were released in 2016 (strong shots for their nominations next year), and I tried to keep off mirror cycles (the Tango lands). The Blighted cycle was different enough. This was the closest race by far; out of 432 votes, only 25 separated first and second place. The biggest snub in this category was Mother of Runes from Duel Decks: Elspeth vs. Kiora. This was the only purely subjective category and you can certainly get mad at me for not including this art. Maybe because I’ve playing longer than the original art has been printed, but I didn’t like the new art. Would it have won? That’s a great debate. This really wasn’t Blue’s year for Commander. Clever Impersonator might have challenged the winner for this one. This was by far the most lopsided of all the categories. This had the most debate online. There was a group of players trying to decide between Dark Petition and Sidisi, Undead Vizier. Early on it was pretty even until the winner pulled away. Originally I had left off Legendary Creatures from colors that weren’t nominated as Commanders, but revisited it when I looked at how many people put Sidisi in their decks. Am I glad I did. Green is the weirdest category for me this year. When I finally decided to allow Legendary Creatures, it knocked off what I was surprised for most used Green card: Shaman of Forgotten Ways. This was a judgment call that I didn’t think people wanted that effect because I didn’t think it was going to win. In fact, the card I thought was going to win because it was used in the most amount of decks, Shamanic Revelation, came in dead last. No one complained about Shaman missing though. Let me know if you did, then I can reevaluate my process for next year. Every once in the while the Oscars give out a Lifetime Achievement Award for someone who never received an Oscar but their body of work is great enough for one. For the first year, I’m giving it to Akroma, Angel of Wrath. Akroma, for the longest time, was considered to be one of the best creatures in Magic. She was used in Vintage Oath decks, reanimator, anything that just needed a huge beat stick. When you have that many keywords on your card you’re going to gain a following. She won the mysterious 64 Legend Bracket DailyMTG hosted 10 years ago and I feel she would still do well if they held one today. She was the poster child for the Time Spiral Timeshifted sheet. When From the Vault: Angels was announced, she was basically a shoo-in. Printed in Legions, Time Spiral (Timeshifted sheet), Duel Decks: Divine vs Demonic, and From the Vault: Angels, Akroma hasn’t been resting, nor has she been dealing mercy for over 12 years. A huge contingent of fans, Akroma deserves this award. All of the Devoid cards were considered for the mana symbols in their mana cost because they could only see play in those decks. Talk to the Rules Committee if you want that rule changed. This explains Sire of Stagnation’s spot on here even though it’s a “colorless” card. In the end, it didn’t matter. The most commonly used Artifact in Commander 2015 is left off this list. Why? Because I just didn’t think anyone would vote for Thought Vessel. According to EDHRec, it’s used in more than 3 times more decks that Blade of Selves, but there’s five times more Thought Vessels than Blade of Selves. This one was close for a while until the winner pulled out an easy win. The second biggest snub was leaving off Mixx of the Izamgnus. I know Izzet players love the little Goblin Wizard but I couldn’t justify putting it on there when four other Legends from the same set had more decks (Meren, Ezuri, Karlov and Daxos). I explained that it was like Ex Machina being left off the Best Picture list this year (One of the best Sci-Fi I’ve seen in a long time). Does this mean I open up the biggest and most important category to more Legendary Creatures like the Academy does for Best Picture? Let me know, because this is one that I’m okay with opening up to more options; however, it will dilute voting if there’s too many choices to people to make. I want to thank to everyone who voted, all 441 of you. Without you, this wouldn’t have been possible. I would also like to say congrats to Jeremy on Twitter for winning the Original Magic Art Tokens. I’ll be contacting you on Twitter. Agree? Disagree? Voice your opinion on Social Media, right here on the comments, or even at me on Twitter (@MTGColorpie – #CMDROscars). I’ll be tweeting more information about the ballot there over the next few days. The 2016 Motion Picture Oscars are this weekend so I thought, “What were the best Commander cards printed in 2015?” There were so many criteria that I decided to break them out into their own individual category. Just like the Oscars. I wanted to throw an awards show for the best Commander cards from last year. This is a nice first step; maybe next year I wear a tux or something. I took data from the ever wonderful EDHRec.com to gather this list. But this is more than just seeing which were the top five cards of each category were. Everyone has their favorites. You are going to vote on them. And on Sunday, February 28th, I’ll announce the winners. Oh, and one random winner is going to win my review copy of the Classic Art Tokens from the Kickstarter that everyone’s been talking about. The Kickstarter won’t be shipping their cards out until August of this year; you can have them months ahead of everyone else. I’ll do more of a review at the bottom and how you can enter and fill in your ballot. And now, the nominees for the 2016 Commander Oscars. Voting ends Sunday, February 28, 5:30 PM Pacific (The time the Oscars start). Obviously having tokens of classic art pieces are a personal preference, but these are great enough to have people take a second glace at them. These tokens are of the highest quality; the print quality is amazing, and the way the cardboard feels in your hand is a nice, sturdy thickness. Everything on the card looks fantastic. The gold border is striking enough so you know you’re dealing with a unique card on the battlefield and to evoke the idea of card art in a frame on a gallery wall. The layout is wonderful (I like the power/toughness box in the center of the card), and all of the relevant game information is visible enough not to take away the focus of the main reason why you want these tokens: the art. Part of the appeal, besides just the great art in general, is a bunch of the humor you have in all of these different creature types. Some of these could have gone to simple and easy choices but it didn’t, and that’s what makes this a fun bunch of cards to hold in your hands. To have the Soldier be George Washington (Sorry to all the British out there), Horror be The Scream, the Germ token is represented by a plague doctor, and Worm be a guy in a library (Book Worm) is some of the great humor you see in the art. Since I don’t know all of the arts, it has the art piece and the artist so you can even call it educational as well. The only art piece I really didn’t like was the 4/4 Dragon one, but if you’ve got one personal misstep in over 100 cards, I think that’s pretty great overall. Again, it’s up to you if you like the idea of the real world coming into your fantasy world as you play the game. I know plenty of people who like card alters so something like this in a Commander setting doesn’t feel out of place. They’re beautiful, well made, and something I think is a fantastic idea. I could keep these cards, but I want someone else to have them and show them off. As you see to the right, here’s what they have for the Commander collection that I suggested should be offered (I’m sure I’m not the only one but I’d like to think I helped). I bought into the $30 tier, one for every token they’ll print, to show you that it’s not something I’m shelling. I don’t support many things that get offered my way because I want to make sure that I believe in that product. This is one of those times where I’m happy to add to the voices out there that love them already. These cards are fantastic and as a Token lover, I want to keep these with my Commander decks. Vote in the Commander Oscar Ballot, and one lucky person will win my review set. I’ve got plans for 21 different Commander decks. Sure, not all of them are built yet, but one of my favorite parts of the Commander format is building and retooling decks. I’ve put together plenty of decks only to tear them apart later (maybe I should be doing this on MTGO). Exploring how decks change between sets is something that’s fascinating and I don’t see on many Commander sites (Let me know if I’m wrong). I’m looking to do something different with my decks and track what the changes are. 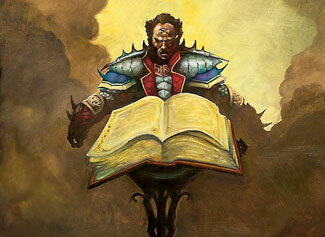 I think we can learn a lot from ourselves and the format if we chronicle the metamorphosis of our Commander decks. Each of my Commander decks has a different version number, starting with 1.0 for the first set I work at catalog on them; i.e, Ulamog, the Ceaseless Hunger 1.0 was started in Battle for Zendikar. Since this is a new process, most of the decks will be versions 1.0, I have several built from Battle for Zendikar and Commander 2015 that are versions 1.0. With so many decks, it makes it awkward to constantly work on the same ones over. So to make things fair between the decks, every time a new set is released I put them in a random order and I’ll work on them as I can. Except this time I chose my Ulamog deck because of the complete turnover of the deck. First, breaking news from the Rules Committee. There are a few changes to the rules. First, they’re adopting the “Vancouver” Mulligan but suggests that in your playgroup you can do what you want. I’ve always liked Partial Paris, but this is an okay move. Second, Prophet of Kruphix is banned. Either you love it or hate it, but it’s getting the axe. Third, decks can now produce any color of mana. Before, if you had something like City of Brass, you could only produce colors that your Commander was. Now, it can produce any of the five colors (Colorless is not a color). You can’t stick a Mystic Monastery in your Brion Stoutarm deck since it has the Blue mana symbol; this rule doesn’t change. It’s for only fringe cases that this mattered. Now, onto the Commander review. I’m going to be taking a look at the seven new Legendary Creatures in Oath of the Gatewatch. Not every Legendary Creature is worthy of piloting their own 99 card deck. Some of these creatures will form their own decks and be seen on tables all over the multiverse. Others, well, they’ll sit in trade binders collecting dust waiting for that one player who wants to do something different. Let’s go in collector’s number order. When you cast ~this~, if you have fewer than seven cards in hand, draw cards equal to the difference. It’s only fitting that the headlining card in the set starts us off. Kozilek has the fancy new Colorless mana symbol in its casting cost. Confused about what it is? I’ll let human giant Matt Tabak explain. Kozilek joins a select few number of true legal colorless Commanders (Karn, Silver Golem; Kozilek, Butcher of Truth; Ulamog, the Ceaseless Hunger and Ulamog, the Infinite Gyre). Since we can only use colorless cards in our decks, this lowers the number of available cards by quite a bit. Most artifacts and lands are colorless (as long as they don’t have colored man symbols like the Khans of Tarkir Banners) so they can fit in here. There are very few sorceries and instants that are colorless, so most of the cards have to be played during your turn. Kozilek here changes all of that. Now, after filling your hand after casting him, you can hope to guard your board with protection you never had before. Plus all the new toys in Oath of the Gatewatch can really open up a playstyle other than lockdown the board. I had a Ulamog, the Ceaseless Hunger that I built after Battle for Zendikar, but him as a Commander never really felt right. Swinging with him does change games but I wasn’t satisfied with him leading my team. I feel as if I can switch in Kozilek into the deck and it makes it that much better. Kozilek can act as a tempo card (12/12 menace for 10) or a control card (countering spells) which makes it just that much easier to shift your strategy around depending on the game. Sheldon then presented four reasons why this rule changed. General Damage Control wrote a nice piece breaking down the four reasons why they’re against it so I’ll just direct you to them instead of rehashing it. I showed off some of my spreadsheet in my previous post and some people on Twitter were looking for it. So I tinkered around with what I had and added some new things. So I’m happy to announce v1.0 of said spreadsheet. I used Office 2013 to make this spreadsheet due to Conditional Formatting, Formulas and Notes that I don’t know how much of it will work in older versions. Because the way this is constructed, it can be used for Tiny Leaders as well. I guess if you don’t mind writing the same card over and over again, then it can be used for any format if you want. There are up to 50 lines for each card type so it can work for most competitive decks as well. Can be used with mono-color, dual-color or tri-color decks. No four or five color decks at the moment. In the spreadsheet I give you the basic template and a copy of my v0.9 of my Brion Stoutarm sheet as an example. There were some changes to the 1.0 version that I just didn’t clean up for the Brion version. The key here is to make the spreadsheet as automated and useful as possible. There are still things I want to do in here (Such as sort each color’s card type by CMC), but I wanted to get the basic functional spreadsheet out. I have notes attached to certain cells and those apply for all the logical cells, please read them so it makes understanding the sheet easier. It’s not completely user friendly, a problem I have when I design spreadsheets for myself, but I’ll be working towards a more elegant presentation. The first screen that you see is the basic decklist, and where the info is presented, NOT where you start typing. If you scroll to the right, you can see the different categories of cards where you fill in the information. The other screen will populate automatically with the info that you put it. Since this isn’t hooked up to a database, you have to fill in the information properly (it’s your fault if you mess up). If you continue scrolling to the right, you see a bunch of extra information to make the whole sheet work. Since I’m still working around in Excel, I’m sure this could be better executed, but at the moment that’s what you get. I have put in the note for the CMC where I found that formula: vorketh on the MTGCommander.net forum. Pretty awesome to have found it which makes this page a bit smaller. Keep track of changes from set to set. More detailed information about the colors in your deck such has the P/T, CMC of each card type, Mana symbols. If you’re looking for a different type of spreadsheet, General Damage Control has one of their own which is nice if you’re looking for more category oriented sheet (Draw/Kill/Combo Pieces, etc). Since I am not really looking to do with this set up, I am passing that link to you if you prefer that for organizing your deck.